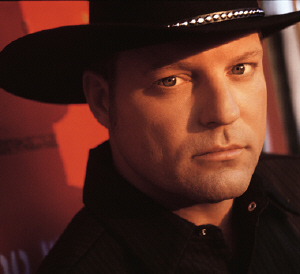 John Michael Montgomery found his way into the hearts of country music fans back in 1992 and in the years that followed, with their help, he had a multitude of hits including five platinum singles (RIAA certified) and an impressive list of awards from the CMA, ACM, TNN and the Grammy's. Despite the fact that he hasn't released many new singles over the last several years, his fans have remained loyal and that loyalty is about to be repaid. "Letters From Home," the title song and first release from the new album, is a touching ode to soldiers who are fighting far from home. With the current state of affairs in Iraq, not only has this song struck a major chord with America but it has also planted Montgomery firmly back on the music charts. Montgomery's smooth baritone is a natural conveyance for the emotional integrity of country music and, unlike some of his earlier releases, this album is more true to the genre. "Goes Good With Beer," a tongue-in-cheek toe tapper, was one of my favorites on this album but the, more somber, "Look At Me Now" is likely to become a favorite for a lot of folks. Bottom line ... Letters From Home is a just reward for those whose faith has never wavered. This collection of songs is guaranteed to add to the seventeen top five country singles and six top five albums that Montgomery has already accumulated.